Cross Sections Sizes: 1/8", 3/16", 1/4", 3/8", 1/2", 5/8", 3/4", 1"
Eqaulseal.com Expanded PTFE Joint Sealant is a soft, compressible gasket material made of 100% pure, expanded PTFE. It is a form-in-place gasket that conforms to almost any sealing surface. Upon compression, it forms a thin, hard ribbon that fills in surface irregularities and creates an extremely tight seal. It is capable of withstanding a wider range of pressures, temperatures and chemical environments than any other soft gasket. GORE® Gasket Tape is a flat, thin, form-in-place gasketing material. This tape can be used to form a full-face, strip-type gasket measuring less than two inches (50.8 mm) in width, for smooth, flat, rectangular sealing surfaces or for narrow sealing surfaces. GORE® Gasket Tape easily compresses into an extremely thin profile and requires minimal compression to seal. GORE® Gasket Tape is an ideal choice when compressed thickness is critical. 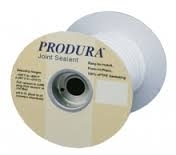 Equalseal.com Expanded PTFE Joint Sealant is a soft, compressible gasket material made of 100% pure, expanded PTFE. It is a form-in-place gasket that conforms to almost any sealing surface. Upon compression, it forms a thin, hard ribbon that fills in surface irregularities and creates an extremely tight seal. It is capable of withstanding a wider range of pressures, temperatures and chemical environments than any other soft gasket. Our PTFE Joint Sealant with an FDA approved adhesive. Eqaulseal.com PTFE Gasket Tape is a flange gasket material made of 100% pure expanded PTFE. requires lower bolt torques than most other gaskets, results in an extremely tight seal, and has an adhesive-backing for easy installation.